In blue, sage and rose to match her home. 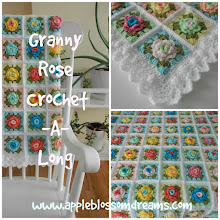 See this post for matching dishcloths that were made last year. Gorgeous! Love that rose pattern! Your so sweet to Mama Corky! 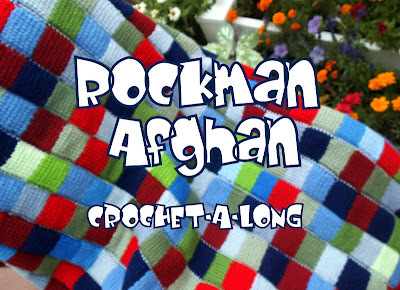 I can't hardly wait till the crochet-a-long! Those are so beautiful. Those dishrags are awesome as well! Still waiting on some new threads. I might have to make a trip and get some if they don't arrive in time in the mail. :'] Hope your enjoying your week! Wow that is beautiful. I wish I could make something as pretty as that. I bet Mama Corky will love it! Have fun with the CAL! I will be watching with interest in case I ever want to host one. I absolutely adore that pillow. It is so beautiful! I am looking forward to your CAL! I already know at least one of my daughters (probably both) will want a petite one for themselves! LOVE the pillow, Astri. It's sooooo pretty. Your Mama Corky is going to be absolutely delighted. Joli cadeau empreint de tendresse, elle appréciera j'en suis sûre. What size is this pillow? 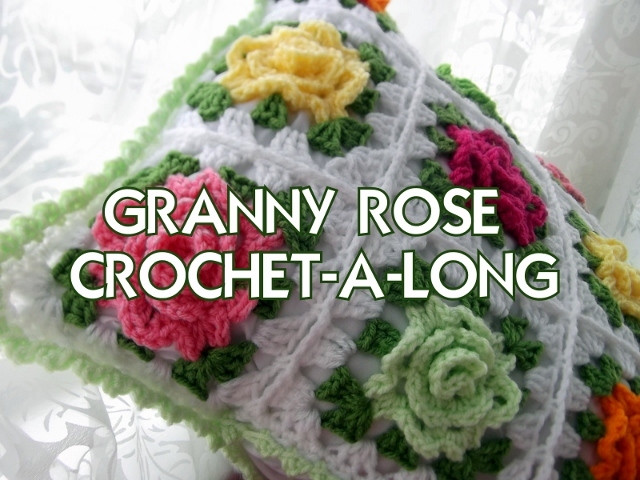 I'm curious as to what size the granny rose squares are. I really like how the 4 rose squares look together...very dainty and sweet. I am also considering 9 squares. Trying to plan out my CAL variation and am trying to figure out what sized pillow I would need. Hello Petunia! The pillow is in California now; however, I believe it is approximately 11" x 11". Each square is a little over 5" x 5". Have a good day! Bobble Zigzag Afghan Ta Da!